Come On Barrow- Let’s Soapbox! Can you see yourself hurtling down a huge ramp in the heart of Barrow Town centre with only the support of your team mates and gravity to help you? 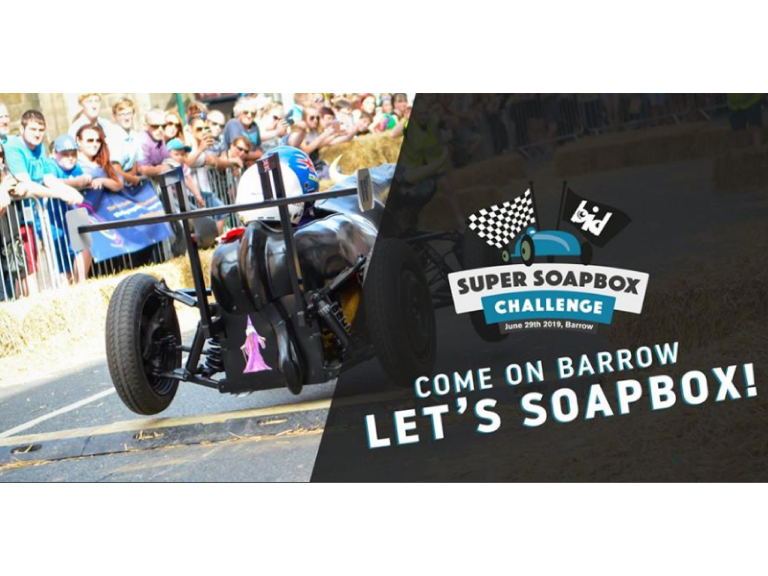 If so, then the Barrow BID Super Soapbox Challenge is for you! Barrow BID is looking for teams of creative, adventurous folk to take part in this spectacular event that takes place on Saturday 29th June 2019 in Dalton Road. Not only do you get to build an incredible cart and enjoy a fantastic days racing – you can help support local charities and organisations at the same time too. The aim of this wonderful community event is to raise money for local charities and create a fun day out that everyone – supporters, spectators and competitors will remember for a long time. The course will be situated along Dalton Road and will be approximately 350 meters long. Each cart will start the race from the top atop a large ramp situated at Portland Walk and as they hurtle down the ramp, soapbox drivers will have to navigate their way around obstacles as they speed to the finish line. The event is a knockout competition with a series of heats with each team having the opportunity to race twice, with the fastest 10 soapboxes going through to the final. All soapboxes set off at intervals and will be electronically timed. To ensure the safety of racers and spectators, safety barriers and hay bales will line the racecourse keeping everyone safe throughout the day. And spectators won’t miss a minute of the action, as not only will there be continuous commentary throughout the day – all the action will be shown on large screens too. It promises to be an incredible day, as well as the soapbox challenge (which is free for spectators) there will also be a funfair and live music to enjoy with plenty of food and drink concessions on hand to keep you fed and watered.